Today we present 4 in 1 subscription widget consisting of slideout Facebook Likebox, Twitter Feed box, Google+ button and Feedburner email subscription box. Giving out your blog's social media presence a push is extremely important now days and the true utilization of your blog's traffic can only be done once you feature your social media connections with such widget. The Social connection boxes slideout each time we hover our mouse upon them elegantly. Below is the demo link to see the live example of the widget. Liked the widget? Follow the simple steps below to add it to your Blogger blog. 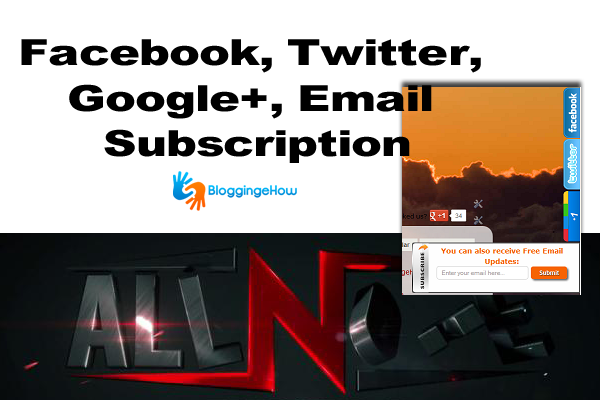 Go to Blogger Dashboard >> Design >> Add a new Gadget and paste the following code with in it. Now replace Orange keyword on the places highlighted in the code above as per instructions. Hope you liked the widget. Leave out your comments below in case of any problem while installing the widget.